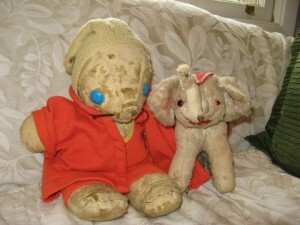 The real Munny and Elephant. Once upon a time there was a little girl named Anya Martin who had a stuffed bunny named Munny and a stuffed elephant named Elephant. She loved them so much, she took her best friends everywhere she went. To her mother’s great disappointment, Anya did not like dolls. In fact, she found them creepy and their plastic even smelled funny. So her mother sewed Munny and Elephant dress-up clothes and wrote and illustrated adventure stories about them, including a trip to Easter Island where the Easter Bunny took them home in a giant flying Easter Egg dirigible. Stuffed steampunk?! Anya grew up and became a journalist and writer, but she never left behind her sense of wonder about the secret lives of toys. One day she visited a woman who had a huge doll collection assembled in cabinets throughout her house. That encounter gave her the idea for an epic adventure that would strike right at the heart of the tension between stuffed animals and dolls. What if heroic stuffed animals had to undertake a quest into the what would be for them a very scary world of Dolls? She had no doubt that Doll-Land was sometimes hauntingly beautiful, sometimes wickedly whimsical, sometimes dark and terrifying. The idea played in her head until that fateful day in spring 2011 when comics artist Renae De Liz tweeted about her dream to gather together an all-women comics anthology. 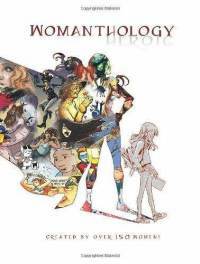 Renae kindly welcomed Anya into what would become Womanthology: Heroic. A few emails later, Renae presented Anya with a list of Websites for artists who wanted to be in the book and were looking for writers. It didn’t take her long to select Spanish artist Mado Peňa, and after a short discussion between the two about their common love for the dark aesthetic of film director Guillermo del Toro, a creative partnership was born. There wasn’t much time to come up with a story so Anya wondered whether she could reduce the essence of “A Stuffed Bunny in Doll-Land” into just four pages. Mado loved the concept, so the two took the challenge, communicating intensely by email across the Atlantic between Atlanta and Barcelona. You can see the result on pages 47-50 of Womanthology: Heroic, published March 2012 by IDW Publishing. Anya and Mado enjoyed working together and knew that the story could not end there. They had so much more to tell in words and pictures about Munny and Elephant. They decided therefore to develop a full-length graphic novel sequel to “A Stuffed Bunny in Doll-Land.” However, because they do not have household names and are relatively new to comics storytelling, and under the advice of a long-time respected editor, they decided to not wait for a contract. Just start the story on the Web, and let you, the fans, decide whether you’d like to experience the whole story. Watch out for the first installment of “A Stuffed Bunny in Doll-Land” soon. And if you like what you see and read, we humbly request that you be prepared to tweet, Facebook, blog and help us get the word out far and wide so we can show editors lots of hits and how much you want to see a print and ebook version.